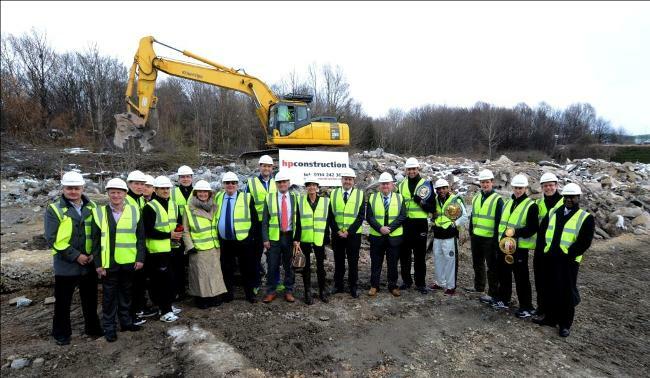 A haulage and logistics company enlisted the support of six top Sheffield boxers to beat the cold weather and begin work on a new £2 million facility. DBL Logistics is creating a new 33,500 sq ft warehouse and office building on Tinsley Park Road, in Sheffield. The development will enable DBL Logistics to significantly expand its warehouse capacity from 1,500 pallets space to around 6,000 and cement South Yorkshire’s position as a key location within the logistics and haulage industry. Boxers Junior Witter, Richard Towers, Tom Mcassey, Jack Perry, Sam O’Mason and David Howe from the famous Ingle Gym in the city joined DBL Logistics for the turf-breaking event marking the start of construction. David and Sam are sponsored by DBL Logistics and both preparing for fights in Sheffield during April and May. Family company DBL Logistics was created by Bert and Linda Clarkson more than 25 years ago, son David is now managing director. The weather has been so cold that we needed some extra weight and power to break the ground. Who better to turn to than some of Sheffield’s best boxers! The development of a new warehouse is a significant and exciting step forward for the company and we are delighted it is now underway. We aim for the building to be completed by the autumn and up and running before the end of the year. The project wouldn’t be possible without the support of a number of people and businesses which have helped get it off the ground, so we are pleased they were able to join us for this special occasion. Phillip Carr and Stephen Evans from HSBC Bank attended the start of work as the bank provided a £1.8million finance package to DBL Logistics to support the development. Also in attendance were Paul Higgins and Brett Lyons from architects SLA Design along with David Hutchison and Richard Powell from HP Construction, which will be building the facility. DBL Logistics is a leading member of the UPN network whose chairman and founder, Martyn Chapman, gave his support to the start of construction.